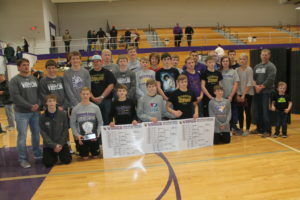 Winner Area wrestling team captured the championship of its home tournament on Saturday. The Warriors scored 233.5 points for first place. Mobridge/Pollock scored 230 points for second place. The Warriors had three individual champions: Kaden Keiser, Wyatt Turnquist and Sam Kruger. Also placing for Winner Area were Riley Orel, 5th; Jack Kruger, 4th; Atlas Willuweit, 2nd; Aaron Gilchrist, 5th; Trevor Peters, 2nd; Preston Norrid, 4th; Riggin Shippy, 3rd; Landon Debus, 5th; Bosten Morehart, 4th; Achilles Willuweit, 2nd; Elijah Blare, 3rd.